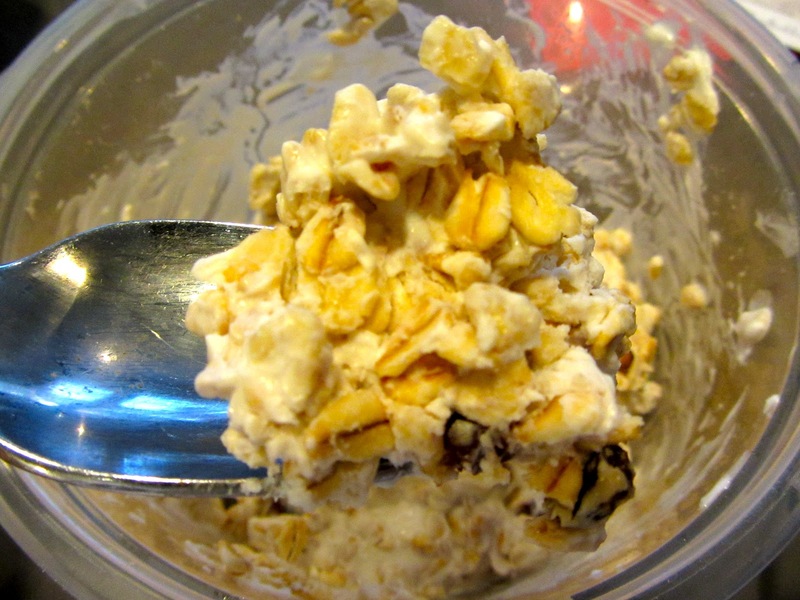 Alright, I'm now finally a huge fan of oatmeal and granola, so it's about time I come around and try these "overnight oats" everyone raves about. No time to pour my mix-ins into my yogurt before heading out the door? This seems to be the prescription for when I know I'll have a very rushed morning. The deal is, as I understand it, that you simply take your plain yogurt, some uncooked rolled oats, and whatever mix-ins you want (chopped nuts, dried fruit, etc. ), and leave it in the fridge overnight, and, like magic, it will be breakfast in the morning. Well, seems pretty obvious, no? Well, I gave it a try. This is the result. That's just what I happened to do on this one morning, but REALLY: these ratios are TOTALLY up to you! Depends how yogurt-y vs crunchy you want your oats! Then, in the morning, you can either dig in cold, or zap it in the microwave for a quick, warm breakfast. Do you like these ingredients mish-moshed together? If you already love overnight oats, did I do this right? (Is there a even way to do it wrong?) Do you have tips, ideas, anything else we should know?